VBlank Entertainment has released tons of details for Shakedown: Hawaii. 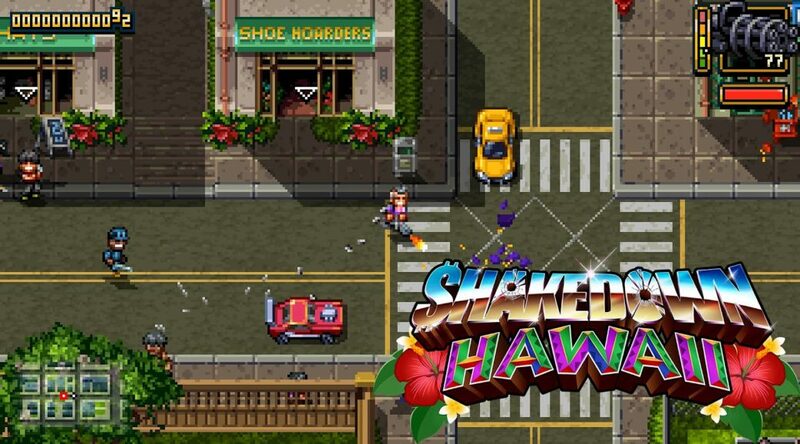 Shakedown: Hawaii is currently in its final stretch of development and is expected to launch for Nintendo Switch and Nintendo 3DS in Q1 2019. Besides a digital release on Nintendo Switch and 3DS, Shakedown: Hawaii will receive physical versions on “select platforms” exclusively at the VBlank Entertainment Store. Hopefully, this will include the Switch. Shakedown: Hawaii is in the final stretch of development… so, here’s the full scoop! This new trailer dives deep into the game — revealing the world, story, empire building, characters, and customization. It’s the biggest trailer yet! I’ll also be doing a gameplay livestream today at 4pm Pacific / 7pm Eastern, on the Vblank YouTube Channel. See the game in action, and subscribe to catch future streams too. Plus, even more is revealed below. Take a watch, then read on down to see what’s been brewing! It will be released digitally on Steam, Nintendo Switch, PS4, PS VITA, and 3DS, and physically on select platforms directly from Vblank, here.